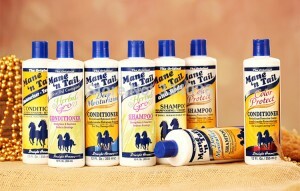 The Mane N Tail shampoo is a horse shampoo that has been repackaged for humans as they accidently found that this shampoo thickens the shaft of the hair. But does it really? The shaft of the hair cannot really be thickened unless the hair strand growth is actually thicker – and this starts at the scalp. What the Mane N Tail shampoo does is saturate the hair strand and make it seem like it is thickened hair – when it has temporarily made it look like that. This is fine for temporary beauty effects for men and women – but there are some warnings you must know. If you have hair thinning, or fine hair and don’t want to lose hair as you grow older, you must understand that this kind of artificial shampoo treatment will cause inflammation and build up in the scalp which works against hair growth, and naturally thicker hair. So if you are actually considering using this, make sure you use it only once or twice a week – as more of this will result in built up in the scalp, and slow down hair growth in the long term. As one expert said; “it makes no sense to use a horse shampoo for thickening hair growth naturally, as it was build for horses, and making their tails and hair clean”; this is why some people think the residue on the hair is actual hair thickness, but its just the residue made for horse hair! I don’t really know what more I can say about this silly shampoo, but just stay away from it if you want a chance to growing faster and thicker hair.